Rufina grandmother was born in 2001 from a desire to preserve the traditions related to the flavors of the past. The grandmother revealed her recipes, jealously guarded, to a nephew, who decided to use the experience gained in strict grandmother to whom he dedicates the name of the company that builds its secrets. Rosolios Nonna Rufina are produced, then as now, using fruit and natural flavors of the highest quality from the territories of Etna. 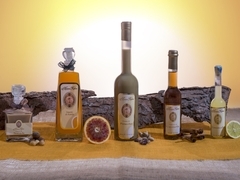 Culture Quality Commitment Nonna Rufina is directed towards the implementation of natural products that are able to evoke the tastes of the bitter historical and spirits Sicilian dear to our tradition. We only select organic raw materials to obtain the best parts through an accurate manual peeling. Our production is periodically subjected to checks that ensure the absolute quality excellence.